. Even if you have large collection of drum loops of different tempos, you will have noticed that if the syncopations of the loop your using don't match what your playing the result is a 'miss-matched/off' feeling. GMD has been designed with this issue in mind, there are no unessential offbeats or syncopations in sight. The result is the ultimate in versatility! "Im having a lot of fun in my practice sessions"
"I think if I had been using this product from the start I would certainly have a better understanding of rhythm and my timing would certainly be better. 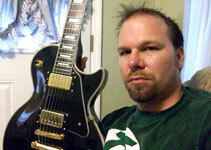 This product is far more interesting to use than a basic metronome and Im having a lot of fun in my practice sessions." 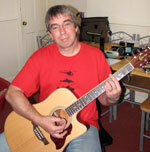 "It's improved my performance by tenfold"
"It helps me with my rhythm which sometimes I have struggle with. This program has some serious beats also... It's improved my performance by tenfold, I love it and recommend it." "They're great to play along with because they sound good and they're well made." The sound quality is outstanding with subtle quantization and accents making a real drummer in front of you...and best of all, dump it into youre iPod and away you go, jam man! I love the fact that with so many styles, it's just that easy as having my computer on, output even into a stereo system or an amp if you have one, grab my guitar, click any track style and with no thinking in seconds....bang-a-gong....YOU GOT A DRUMMER. Great stuff Andy and keep up the great work that you produce. FILL IN THE FORM BELOW FOR 13 FREE TRACKS! Want more? 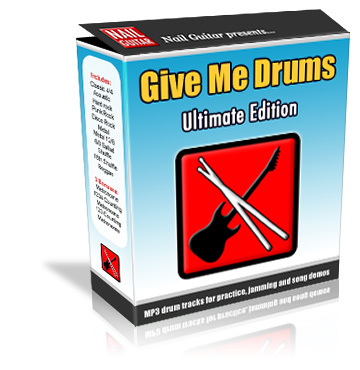 Get these 3 awesome bonuses with GIVE ME DRUMS - ULTIMATE EDITION! Some times you do want the simplicity of the metronome for practice so Im giving you an unbeatable collection of metronome tracks that are ready to load onto your ipod and take anywhere. Because it's digital takes up no space and is weightless. Learning to keep count as you play is a skill that normally takes years to develop. Practicing with the '1234 Counting Metronome' teaches you to count beats as you play. No more getting lost not knowing where the change chords. 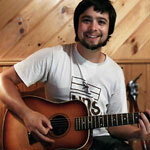 Its also great for teaching, I use it heaps when teaching guitar lessons. The next most common beat count is bars of 3 so it only makes sense the have a 123 Counting Metronome aswell. Ask any accomplished musician and they will tell you just how important to develop your 'internal metronome'. learning to read and count rhythms is one of the most challenging aspects of any musical instrument. 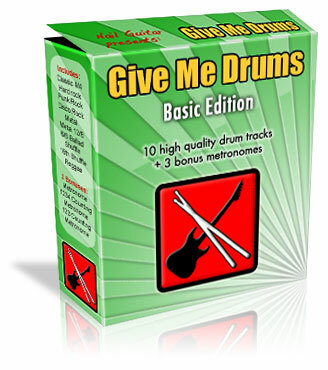 Your Give Me Drums purchase is Risk-Free! Use Give Me drums for 30 days, if for any reason it doesn't live up to your expectations you can email me for a full refund. When you buy Give Me Drums, I want you to feel completely comfortable with your purchase. If for ANY reason it turns out Give Me Drums isn't for you, you can return it for a prompt and friendly 100% refund of your purchase price. You can return it tomorrow, next week, or up to 30 days from now. What's more you can even keep the 3 bonus metronome sets as my thanks for giving it a try. You really can't lose. Mobile users: Use the green arrows below to navigate purchase options. The physical version includes postage to anywhere in the world. For estimates on delivery time see the FAQ below. 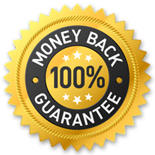 Yes, our products are sold through Teachable.com - they are one the biggest and most trusted online retailers specializing in digital delivery of products. At check out you will be prompted to enter your email. Immediately after purchase you will be sent a secure download link to immediately start your Give Me Drums download. Can I download Give Me Drums direct onto my phone or tablet? Android users, yes this is possible. iPhone & iPad users, this is NOT possible. However, you can download Give Me Drums on your desktop or laptop computer and then load the tracks onto your tablet or phone just as you would any other MP3 music file. What is the expected delivery time for the physical version? You will receive a digital download link while you wait for your physical purchase to arrive. For 3 days only to get $10 off Ultimate Edition!